Global Moderators are Community Managers for Rare. They moderate all social and community spaces and they have the power to issue bans. Hi, everyone. I&apos;ve been a Community Manager since 2016, though I took a year-long break to raise a mini-pirate! I&apos;m glad to be back aboard the good ship Rare and I spend my free time hanging with my family, gaming (often tabletop games) and reading. Fun facts: I&apos;m an American expat living in the UK, I have a dog that looks like a little fox, and I&apos;m a fan of the Oxford comma. I&apos;ve loved video games for as long as I can remember. Created my own Xbox Podcast and Community website, organised several charity events around gaming and received the Microsoft Xbox MVP award for 6 years in a row. Love helping the community and attending events and expos like E3 and PAX. Is there a Global Moderator in my Time Zone? Moderators are volunteer moderators are officially active in the Sea of Thieves Forums and and Verified Discord. Moderators are only active as moderators in their community space. They moderate to the Pirate Code and official rules of their community. Forum Moderators cannot moderate the Verified Discord and vice versa. Co-operating with Rare staff in upholding community guidelines. Keeping discussion on topic. Moving and locking topics when appropriate. Flagging breaches of conduct with Rare admins (e.g. NDA breaches, toxic behaviour). Offering help and assistance to community members who need it. Global Moderators, Deckhands and Moderators work closely together and regularly discuss certain information ahead of time in preparation for events, shows and policy or process changes. This allows Moderators to better anticipate high-traffic periods in the community and to provide more accurate information to community members in need of assistance. Moderators are not an official voice of the studio, but we do want the community to put their trust in them as they will happily do all they can to help you with the information that we provide them! It should be noted that our Moderators are under NDA and should not be pressed or harassed for information. I saw the Sea of Thieves trailer at E3 ..2017(?) and immediately came here to sign up as an Insider and was invited to the very next Tech Alpha! The first time I played, I was hooked. Despite rarely playing online and using a microphone (with strangers no less) was even rarer…but for hours, never have I ENJOYED playing a game so much. I love helping in community Sea of Thieves events with Fortune (along with the various other fleets/crews/unions) and the first impression I made with them was…memorable…. Outside of Sea of Thieves, I busy myself with a few other games (Forza, AC..), dabble in 3D modelling using Blender and very much enjoy the hijinks (and occasional usefulness) provided by using PhotoShop. I&apos;m Aerotsune, though many have come to know me better as Badger due to my Discord nickname within the community. And, well, it just kinda stuck. To the point that I was requested to use it by some of the leadership going forward. So that&apos;s here to stay. Despite joining up with the ranks of the other fine moderators of the community (I&apos;m talking about you, Deckhands! And Community Managers, of course...), I&apos;m just another one of you guys for the most part. I started off a general user like everyone else. But as the community continued to grow it was decided that an extra set of eyes could be useful to help assist with the usual crew. So here I am! At any rate, I look forward to a continued enjoyable experience with you lovable goofs and will see you around! Is there a Moderator in my Time Zone? @Musicmee, UTC 0 @triheadedmonkey, UTC 0 How can I help the Moderators? The Global Moderators are employees of Rare and the Moderators are fulfilling their roles voluntarily out of their dedication to both Sea of Thieves and the community. Please be as supportive of them as possible! Abiding by the Forums and Discord Terms of Service and Guidelines. Following our Community Pirate Code Being co-operative and understand that they are working as an extension of the official Rare Global Moderator staff. Working together to make sure the Sea of Thieves community remains welcoming. If you’re not sure about something, don’t hesitate to ask them questions. The Moderators are here to help maintain a positive atmosphere on the Forums and the Verified Discord to provide you the most accurate information available, so do your best to support them! Release + Patch Notes Discussion can be found here. Official Contests from the Sea of Thieves Team. I wish there were links to the stories on the article. LongLiveCayde6 with “The Old Gran and the Sea"
Deckhand DHG IXxRMACxXI is stepping down - let's all say thank you! @DHG-IXxRMACxXI nooooooo... Say it aint so! It really will not be the same without you here. Wishing you fair winds and good sailing from this side of . As of today Riley, who many of you may know as @DHG-IXxRMACxXI on our Forums], has chosen to step down from his role as a Deckhand and will no longer be active within the community in that capacity. Riley has been a pillar in the community since joining the Forums, and this has continued during his tenure as a Deckhand both here and on our official Sea of Thieves Discord. Throughout our Technical Alpha, launch and the year that&apos;s flown by since then, Riley has been there flying the flag, supporting both our team and the community alongside his fellow Deckhands to make sure our Forums and Discord remain awesome, friendly and welcoming to all. It goes without saying that Riley&apos;s ongoing contribution to this community will be missed, but at the same time, on behalf of Rare, we&apos;ll be forever grateful for what he&apos;s helped us achieve in that time. Please join us in saying a big thank you to Riley for his time and effort in being an invaluable member of the crew! We&apos;re aware of the issue several players are experiencing whereby Year One cosmetic rewards are failing to appear in their chests. Due to volume, the rewards are still in the process of being rolled out, so everyone should have their cosmetics come Monday. Sea of Thieves Design by Humans Fan Shop - get your art on official merchandise! We&apos;re excited to reveal that we&apos;re working with Design By Humans! The new Sea Of Thieves Fan Shop will allow our community (you lovely lot) to submit your Sea of Thieves fan art for consideration to be turned into official merchandise! Create a piece, send it in, our team takes a look and if we approve your design it&apos;ll be printed on official merchandise, with you receiving a cut of the profits! The submissions will be reviewed by our team weekly. @ComicSundew5982 Please refrain from spamming on the forums, as it is a violation of our forum rules. Your post has been removed accordingly. *Bullying and encouraging users to bully others. Our second Sea of Thieves Weekly Stream will be going live tomorrow at 5pm BST! This time, join Beardageddon and a selection of our Dev team for a scavenger hunt! How much gold will they be able to gather in 2 hours /without/ doing any voyages? Introducing the Verified Sea of Thieves Discord Server & your newest Discord Deckhand! @therealsourmeat Please make your request to support as it cannot be answered here on the forum. Please do not add to posts that are over 1 month old as it is considered a necro, and is against our Forum Rules rules. Bumping threads with content that is not providing additional information to the original post is not permitted. Resurrecting very old threads is also not permitted. A warning will be issued and the thread locked. Ignoring the warning will result in a temporary ban from the Forums and a final warning. If the action continues, a permanent ban from the Forums will be issued. It&apos;s Launch Day and our lovely pirate community is larger than ever! We&apos;re introducing a brand new community space, which we are really excited for you to join and be part of it! Introducing our Verified Discord Server! Join the Sea of Thieves Discord Server! Check out the Sea of Thieves community on Discord - hang out with 64,930 other members and enjoy free voice and text chat. We&apos;ve seen the positive impact Discord has in the community, so we created a space where we could give you the most up to date information, and allow you to share your pirate adventures! Our Verified server still work in progress! This is a space for you as much as it is for us to talk to you! So, if you&apos;ve got suggestions, please put them in the #discord-suggestion channel and we&apos;ll review as needed. Like our Official Xbox Club and Official Forums, the Sea of Thieves Discord will be moderated by Community Managers and Deckhands. Who are the Deckhands you ask? Well! Deckhands are Community Moderators who work closely with Rare staff to make sure our community is a fun, place filled with all the right information for your Sea of Thieves adventures. You can read more about them and their responsibilities in the community here. And speaking of Deckhands... we have our very first Discord Deckhand! Please join me in welcoming the newest Deckhand @Taydoge-Swift! 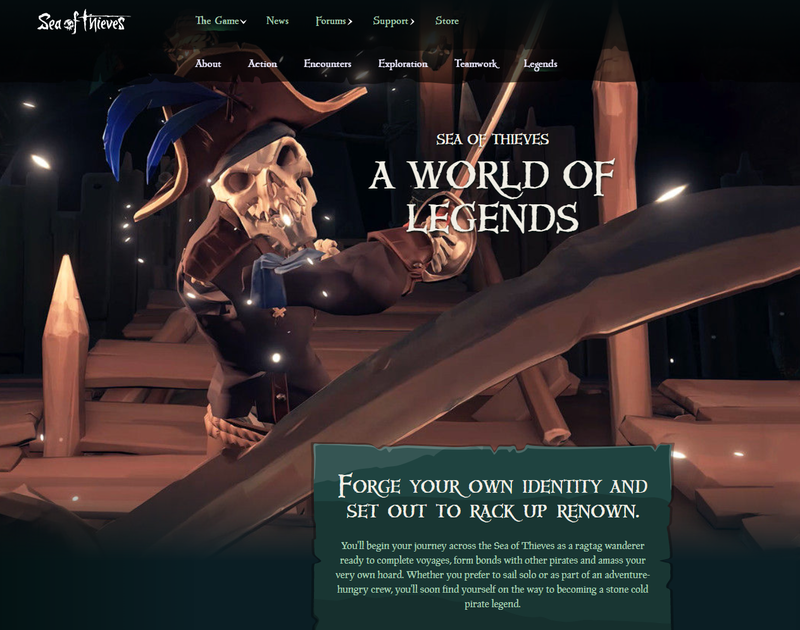 Our new dedicated webpage for more juicy details on our upcoming free Sea Of Thieves content update: Cursed Sails is now live! Ahoy there community, to celebrate the Pirates who are positive members of our community, who are fairminded but respectful of the Pirate Code and Forum Rules we have created a new title, Boatswains! This new title has no responsibilities, or official duties but we hope the Boatswains will play a key part in welcoming new players into the community. We will be adding to this group fairly regularly, and are always on the lookout for new Boatswains! With Forsaken Shores just over the horizon, what better way to celebrate than by challenging our community to create some incredible Sea of Thieves content? You came out in your droves to do battle with the skeleton crews plaguing the Sea of Thieves and had the stories to share. We saw such a wealth of creative talent take part in our Cursed Sails Challenge, we just had to do it again. Allow me to present our Forsaken Shores Challenge. From September 27th to October 24th, we want you to submit your Forsaken Shores-related content to us. We’re announcing our competition a little early to give you a day to plan. As in our past challenges, we&apos;re looking to reward our winning submissions with some fantastic prizes. Our friends over at Corsair have provided us with two Corsair Gaming bundles to give to our winners and we&apos;ll even throw in a shiny Forsaken Shores T-shirt. Meanwhile our runners-up will receive the same shiny t-shirt and an exclusive Sea of Thieves journal. Best Forsaken Shores Video - This can be anything you want it to be. As long as it&apos;s themed around our Forsaken Shores content update, we want to see it. Be as creative as you like! Best Forsaken Shores Fan Art - In our last challenge, we were blown away by the sheer creative talent the Sea of Thieves community demonstrated, and we need to see more. We want to see your paintings, 3D art, sketches, whatever you can create! We also encourage you to share screenshots of your adventures in The Devil&apos;s Roar with us on social channels using the #SoTShot hashtag, but to be in with a chance of winning these fantastic prizes we&apos;re looking for video and fan art entries as described above. As usual, we&apos;ll be judging your submissions based on the following criteria: Creativity, Originality, Hilarity, and things that make us go "Oh wow". Keep your videos and fan art family-friendly. Please keep your entries free from bad language and inappropriate content. Keep an eye on video length. Please keep your video submissions to 10 minutes or under. We actively encourage you get your crew involved in this challenge. However, only the account that submits the content will be eligible for the prize. Content must have been created by you. Exactly what it says on the tin. Please don&apos;t submit clips or fan art that another pirate has made. The content you submit must be your own. One winner from each category will win a Corsair gaming set which includes 1x Harpoon RGB Gaming Mouse, 1x K68 RGB Mechanical Gaming Keyboard, 1x HS60 Surround Stereo Gaming Headset, 1x MM800C RGB Polaris Cloth Edition Gaming Mouse Pad and a Forsaken Shores Foil T-Shirt. One runner up from each category will win themselves a Forsaken Shores Foil T-shirt and a Sea of Thieves Journal. Tweet your submission to us on Twitter using the hashtag #ForsakenChallenge in your tweet. Upload your submission to Instagram using the hashtag #ForsakenChallenge in your post. Enter on Facebook by leaving your submission on our wall with the hashtag #ForsakenChallenge. If you&apos;re submitting video content to us it must be hosted on YouTube. Your upload must include the hashtag #ForsakenChallenge. Submit your content here on the Forums. Submissions posted in this thread will not count as an entry. The winners and runners-up will be contacted on October 29th and we&apos;ll announce them on our social channels and website on November 2nd. This contest opens on 00:01 BST on September 27th 2018 and closes at 23:59 BST on October 24th 2018 inclusive (the “Entry Period”). Entries received outside of the Entry Period will not be considered. Click here for full Terms and Conditions. Save your questions for next week! The team will be back sailing again next Tuesday at the same time, thanks for watching! Introducing the Sea of Thieves weekly stream! Starting this Tuesday at 5pm BST, our team and special guests will undertake a series of nautical challenges and trials. You can catch the streams on Mixer, Twitch and Youtube! First up - the Six Tavern Challenge! We're going to San Diego Comic-Con 2018! @khaleesibot So when shall we mark the calendar for the SoT Australian tour? When that time comes, just remember to smear Vegemite over your face to repeal drop bears and always travel in a group for safety. The crocs will only go for the weakest, slowest of the heard so don&apos;t forget to pack your running shoes... or invite unfit people to tag along. Then again, as we have just as many deadlies in the water surrounding this beautiful continent as there are on land, you&apos;re probably better off wearing stilts. Headed to San Diego Comic-Con tomorrow? Come stop by our panel, where members of our crew will be joined by the fantastic Freddie Prinze Jr to discuss the lore and expanded universe of Sea of Thieves! There&apos;s freebies up for grabs too. More details in the image below! I hope for the Skellis that they let there Gunpowder Brothers on the Islands. Now that July&apos;s upon us we&apos;re about to unleash the most substantial update yet! Cursed Sails will be unfurling on July 31st, and like our other content updates it comes free of charge to all who own the game. For more information on what is to come, check out our Cursed Sails article. Using difficult to read formatting. A warning will be issued, the post deleted or the thread locked. Ignoring the warning will result in a temporary ban from the Forums and a final warning. If the action continues, a permanent ban from the Forums will be issued. And as this thread was over a month old originally, and recently revived by you and @biggie-tizzle , it will now be locked. A general reminder to all, please avoid reviving threads past 1 month old, as it is considered a necro, and is against our Forum rules. We&apos;re VERY excited to announce our full set of 60 (SIXTY) launch achievements for Sea of Thieves! You can read the full blog here, check out all the artwork individually on Facebook, and feel free to discuss and speculate below in true #SeaOfTease fashion. The Hungering Deep Shirts have been unleashed on the Sea of Thieves Store! These limited edition Hungering Deep T-shirts are now available for the duration of the Hungering Deep Campaign. So what are you waiting for, jump into our official store and let the world know that you personally dealt with the Megalodon! It&apos;s available in unisex and ladies. @nefrit-od What does this mean? And I am still waiting fro crabs too. Might have to do with how they&apos;re carbon copies of the ones locked behind the rank requirement. After this date they will no longer be available for purchase, but if you have bought them they’re yours to keep! Additionally, Castaway Bilge Rat weapons and ship liveries will be lowered in price. Anyone who purchased items within this set pre-price adjustment will have the difference reimbursed. We’ll also be introducing new, more varied cosmetics to the game within the coming few weeks so keep your eyes peeled and your coffers primed for the next drop! Happy Month-erversary Sea of Thieves! Sea Of Thieves launched a month today! We want to extend a big thank you to everyone who has sailed along with us on a quest to Be More Pirate! Here&apos;s to a fun-filled future together! If you have feedback you&apos;d like to share with us, we&apos;re all ears in our Feedback Forum! Got an epic tale of your adventures to share? Head on over to Tavern Tales to regale us with your stories! @axiom2213 No Axiom! Why risk your play session by playing with randoms? How do the servers pick you a nice crew? Please, use the &apos;&apos;Looking for Group&apos;&apos; function beforehand. From the very beginning, we&apos;ve been determined to make Sea of Thieves a truly welcoming world in which players of any creed, culture, age, skill level and circumstance can voyage without fear of friction or frustration. With that in mind, we&apos;ve laid out a set of rules with corresponding actions to help to keep the Forum seas free of strife and grievance (beyond that stirred up in the course of a pirate&apos;s everyday activities). You can find the Official Sea of Thieves Forum Rules here. From today, Global Moderators and Deckhands will be moderating the Official Sea of Thieves Forum to these rules. For posts and topics which were created before the rules went live, we will be moderating and locking as before but also posting a link to the new rules so everyone is aware of moderation for the future. Thank you Pirates for the passion, excitement and activity that you&apos;ve shared on these Forums! Introducing the Official Xbox Club! @khaleesibot I believe you can post a link to a club, though I&apos;m not sure exactly how that works. Might be a good idea to edit that into the OP for those who want to join or for those who can&apos;t find it. Many of you asked for this, and now it&apos;s finally here! At long last, an official Xbox Club for anyone to join, chat, and find likeminded pirates to sail on the seas with. Remember, as with all official community spaces, the Pirate Code is in effect! Signed Copies of the 'Tales of Sea of Thieves' book now available on our store! Remember when we introduced our upcoming lore book? It&apos;s now on our store and pre-orders placed from our store will be signed by members of the team! You can pre-order the book here, or get a bundle with a t-shirt here. This product is available as a preorder item and will be shipped week commencing 19/03/2018. You will be charged for this purchase when you checkout. If you order a pre-order item and regular items they will be shipped to you when all the items are available. Welcome aboard Pirates! It's Launch Day! The pvp aspect needs work - Ok so main issue is, dying has no significant penalty. Increase re-spawn time to at least 1 minute per death i would say 90 seconds would be ideal, and 3 minutes to re-spawn a new ship! ship aspect is very important as players just run at you with new ship once you have downed theirs, and when your trying to assault skull islands its too quick respawn. Another idea we thought of... REWARD the players for killing a ship regardless of loot on-board by leaving a crate where the ship was. Also for multiple ship kills in a row without losing your own, could leave progressively better chests? Questing needs work / more PVE creatures to kill more random unusual missions to do maybe better interaction with the npcs? they seem void of anything after you have spoken to them once, I keep hearing that your adding to the game.. which i hope is the case but generally better more interesting variable quests with rewards other than aesthetics needed. I also think maybe some temporary upgrades on the ship nothing game breaking or overpowered just like upgrading the ship 1,2 or maybe 3 times per login for better performance or damage would be a nice thing to do. A clan / or guild system would be really enjoyable, some kinda of internal chat areas for players to forge groups etc, not having to use forums. Also the option to invite players directly onto you ship once you are already sailing and on quests would be good. Better rewards! i mean i can stomach the only reward mechanism being asthetics, but it would be nice to have some actual player progression as well. I mean you could have split servers where some players can play with no advantageous progression (i.e harder hitting weapons and cannons) and servers for those who don&apos;t want it. Would make grinding the quests feel like there was some purpose. This post isn&apos;t in the right area and is not a rant I see so much potential with the game and love the world you have created we just feel with a few steps in another direction it could be so much more ! keep up the good work and hopefully some of what I am talking about makes sense. Peace from Hertz Gaming-! We are doing a rolling launch, so to check when the game is available for you to play in your region, check our Support Article! Sea of Thieves is now live and available to play for our first wave of pirates in New Zealand! G&apos;day and welcome to pirates in Australia! Welcome aboard! We&apos;re now live and available in Japan and South Korea! Welcome aboard! Hello and welcome to our newest crews and fleets from Hong Kong, Taiwan and Singapore! Live in India! Welcome to Sea of Thieves! Welcome aboard Russia, Saudi Arabia and Turkey! Time to set sail, Finland, Greece, Israel and South Africa! Climb on board! Whoa! Our biggest group of pirates yet, welcome! Time to start your voyages United Kingdom, Ireland and Portugal! Welcome aboard! We&apos;re live in Argentina, Chile and Brazil! Welcome aboard pirates! The time has come! Welcome pirates from the United States and Canada! We&apos;re live in Colombia! Welcome pirates! Ahoy there, welcome to Sea of Thieves, Mexico! This post will be updated when we enter a new region. As the stream is over now and as mentioned above, there is a webpage where most concerns can be answered regarding the mixpot, I&apos;ll close this one down. If you didn’t receive your MixPot within one week after watching the Xbox Live stream on Mixer, visit xbox.com/mixpot. Make sure to link your Mixer account to your Microsoft/Xbox Live account to get the skin! Can&apos;t wait to play when I have some free time! I would stay up till midnight but that might not be good for work tomorrow! We hope those of you who had the opportunity to enjoyed your voyage this past week, and we’re so glad you could be part of the biggest and best Sea of Thieves Technical Alpha ever! We’ve had some epic stories shared with us, including an amazing gold haul! Alas, as with all good things - we must bring the Technical Alpha to a close. Your feedback and the data you&apos;ve generated in the past year of testing has helped get Sea of Thieves ship-shape. To thank you for your help during this stage in development, we’ve granted you the title of Founder! Guaranteed access to the Closed Beta in 2018 so you can continue your swashbuckling ways! A brand new forum badge to show your fellow pirates you’re not to be trifled with. With the end of the Technical Alpha means we’re going to be doing some general housekeeping in the Forums, there will be categories that merge, some that have become read only and categories that have disappeared. Our goal in this is to open up the forums to use as we noticed that some categories (Technical Alpha and Insider) were used disproportionately more than others. We’ll be back in 2018 with information on the Sea of Thieves Closed Beta and even more sneak peeks for what’s coming in Sea of Thieves, so stay tuned! @musicmee Well played sir! Sleeping through the day for the 00:00 hours release time xD Then the SoT shift begins! A brand new trailer was shown at the The Game Awards yesterday and in case you missed it, grab your popcorn, move to the edge of your seats and hit play! In amongst the chickens, explosions and general pirate mayhem was our release date. It&apos;s finally here! Sea of Thieves is setting sail on the 20th March 2018 for Xbox One and Windows 10 PC, with Xbox Play Anywhere, cross play and Xbox One X enhancements. Phew, that&apos;s a mouthful! You can pre-order through our shiny new pre-order page, or via the new Pre-Order button right next to your profile icon. 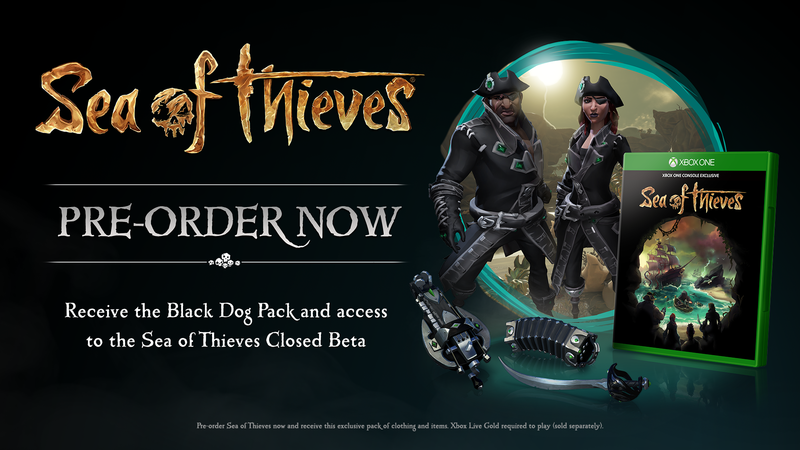 Pre-ordering gets you an awesome Black Dog Pack with some very stylish items and access to the Sea of Thieves Closed Beta! We&apos;ve also updated our The Game pages... there&apos;s a lot of treasure to be found in those pages! But wait, there&apos;s more! As a Sea of Thieves Insider, you&apos;ve helped us to build the foundations of this swashbuckling adventure. As a thank you, we&apos;ll be granting all Insiders who signed up before the December 1st 2017 deadline, free access to the upcoming Sea of Thieves Closed Beta! But wait again? There&apos;s even more?! Oo yeah, this beautiful limited edition controller is also available for pre-order. It comes with an exclusive in-game Ferryman Clothing Set, 14-day Xbox Live Gold trial and 14-day Xbox Game Pass trial with access to 100+ games (available to new subscribers only). We&apos;re pirates, so I guess.. it&apos;s a hype boat? Get on the hype boat! Game Pre-order Bonus: Black Dog Pack & Access to the Sea of Thieves Closed Beta. Insider Bonus: Signed up before the December 1st 2017 Deadline? You have access to the Closed Beta! Controller Pre-Order Bonus: Exclusive in-game Ferryman Clothing Set, 14-day Xbox Live Gold trial and 14-day Xbox Game Pass trial. From playing the beta, watching tons of gameplay and content on the game, I&apos;m very excited to play. Already have a crew just waiting on the release! At last the time has come to sail again and this time in our Final Beta! The road to this beta has been mysterious and full of conspiracy theories, I must say you&apos;re all a very creative bunch! For information on the Final Beta, who can play and our goals for it, read this article by our Executive Producer Joe Neate. We have a brand new Game Status Page which is where you can get the most up to date information on any game issues that are widespread. Installation instructions can be found here, information about bug reporting and any other issues, please contact Support. Want to know what else besides these lovely shiny items are in the Final Beta, check out the Release Notes. Happy sailing Pirates! See you out there on the seas. Welcome your newest Deckhand - II Mikez II! As we get closer and closer to launch our lovely pirate community is growing and rapidly! The Clubs have become so active which is why we have decided to add to our Club Deckhands! While Club Deckhands will primarily be focused on the Club, they are still available to help out in the Forums. Who are the Deckhands you ask? Well! Deckhands are Community Moderators who work closely with Rare staff to make sure our community is a fun, place filled with all the right information for your Sea of Thieves adventures. You can read more about them and their responsibilities in the community here. Since we last introduced new Deckhands, we have moved from the Technical Alpha stage of development, had a very successful Closed Beta and can see launch right there on the horizon. Exciting to think of what could come next! Thank you all so much for all your streams, feedback, suggestions, fan creations, stories and the way you genuinely care about ensuring all pirates who want to be part of the Sea of Thieves community feel welcome! Your hard work and your contributions make Sea of Thieves the amazing community it is! So without further ado, please join me in welcoming the newest Deckhand @ii-mikez-ii! Hey all! My name is Mike or II Mikez II on Xbox Live (original I know!). I live in Birmingham, second largest city in the UK. Been into gaming for as long as I can remember. Started on my Dads ZX Spectrum, moved onto Dreamcast, Sega Megadrive then Playsation and Playsation 2. But since the glory days of Halo: Combat Evolved I&apos;ve been a massive Xbox fan and have not looked back since. Like most others here Sea Of Thieves peaked my interest at it&apos;s first E3 showing. I finally got my chance to play after I was invited to the Alpha for the E3 2017 sessions back in June. I&apos;ve been very involved in the community ever since. Though I&apos;ve been hopping onto the forums a lot more recently, you&apos;ll usually find me in Chat on the Xbox Club where I am very active. I have been helping out the Admins there unofficially for many months now, so it was a great honor to be asked to help out officially! We have a great community and I feel privileged to do my part to help it stay that way. Always happy to help, see you in the Club or on the seas! Ahoy Pirates, another Scale Test is on the Horizon! That&apos;s right! We are now running a third Scale Test, beginning on Friday March 2nd at 10am GMT (2am PST) and ending on Sunday March 4th at 10am GMT (2am PST)! For more information on what a Scale Test means and if you can participate, check out our updated Scale Test Article! You won&apos;t need to wait long to set sail again! Hello guys in case if you can`t see the game in your Xbox insider Hub, you should to change region in start - setting time and language - region and language, try to set Finland. It is work for me, now i am finaly downloading client. Ahoy there Pirates, Closed Beta is soon upon us! Now with Play Anywhere enabled, the choice is yours to decide which platform you want to play on, Xbox One or Windows 10 PC! To help you begin your adventures here are some handy installation instructions. Pre-order or Founder, Xbox One or Windows 10 PC, all the instructions are there with handy screenshots. Horray! If you are trying to find the Windows 10 PC version and cannot, click this link to take you to the store, you should be able to pre-load the game from there. As always, make sure you&apos;re signed in to the gamertag that you were either invited in (if you&apos;re a Founder) or pre-ordered with. See you on the seas pirates! The Gold Hoarders have settled in our Store! Not content with being part of the Scale Test, the Gold Hoarders have landed in the Official Sea of Thieves Store with two new items for you to spend your gold on! These are pre-order items and will be shipped week commencing 19/03/2018. You will be charged for this purchase when you checkout. If you order a pre-order item and regular items they will be shipped to you when all the items are available. Locking this thread to avoid anymore confusion! Thanks! We&apos;ll be running a Scale Test this weekend to prepare ourselves for launch! The goal of this is to test a lot of the work we’ve done since the Closed Beta, and to try and hit a higher concurrent players number than we’ve ever seen before. With this added scale we expect – and plan – to see issues, that we can learn from and address. Not only are we looking to hit scale, we will also purposefully be stressing our services by throttling performance at certain times, testing the game in different data centers around the world, and simulating deliberate outages. Sea of Thieves for Windows 10 PC - Let's talk about Specs! What should i run my settings on? @khaleesibot The Be My Valentine bottom pic looks amazing. Roses are red, violets are blue, you&apos;re all special pirates and here&apos;s our gift to you! Love is in the air, and also on the seas! Valentine&apos;s Day is here, and in the spirit of piratey love we have some cards you can print out and give to your loved ones. What&apos;s your favourite card let us know in the comments!